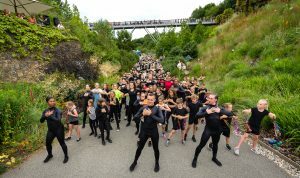 On 17 July 2018, 41 of the most talented young dancers in England from the National Youth Dance Company (NYDC) joined Propeller and 10 primary schools to take part in a unique dance event at the Eden Project. 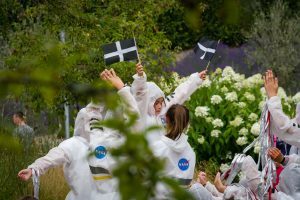 ‘Space Time’ was our second multi-schools dance event to take place at the Eden Project after ‘Ghost Dancers’ in 2017 with Rambert. 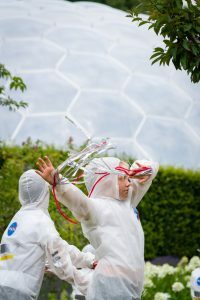 ‘Space Time’ was an afternoon of dance performances created especially for the spaces in and around the Mediterranean Biome at the Eden Project. 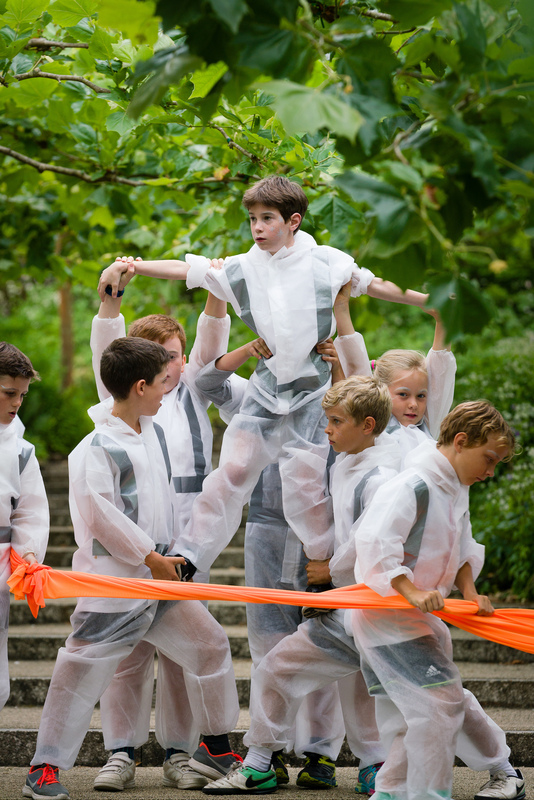 Each group of dancers explored a particular theme related to space or time and performed them in specially chosen sites including the Lime Steps, Spiral Garden, Avenue of the Senses and many more. NYDC and Propeller performed in the Story Telling space in the Mediterranean Biome. Dancers from Propeller took part in a May half term residency working with Yaa Appiah-Badu to create a new work combining African and contemporary dance to music by Thomas Mapfumo. They also created a new piece with dancers from NYDC based around the choreography of Sharon Eyal which they performed at both Eden Project and at AMATA, Falmouth University as a curtain raiser for the NYDC show ‘Used To Be Blonde’. Space Time came to a spectacular finale with 380 young people dancing on and around the bridge near the Core Building. The finale was choreographed by dancers and artists from NYDC during a residency at Falmouth University in May and then taught to the primary school children involved. ‘Primary school is all about creating the memories that act as furniture for the rest of our lives to sit on – and what a fantastic set of memories and experiences. Thank you and well done from all at Stratton Primary School. What a fantastic day-I’m you tubing all the music now and playing it at our talent show tomorrow! The children get so much from this. Grace Clayton is inspirational. What a cool teacher! Thanks to all the team involved! Wow – What a day !! Thank you so much from us all at Otterham. The communication between everyone was amazing. It was an incredibly organised day, everyone knew what they needed to know. The parents were bowled over by the event. I think what was brilliant was the fact that the children could see the progression from ks1, right through to Propeller, and The National. I know it really inspired my children, especially the boys. The sheer amount of male dancers and the incredible costumes within NYDC was an inspiration. I would like to say a big thank you. Lostwithiel Primary had an amazing day at Eden for the space/time dance project. The day was incredibly well organised and ran smoothly. The children thoroughly enjoyed themselves and we had incredibly proud parents. I would like to say a huge thank you to Grace for being so positive and helpful during our rehearsals and for teaching the children such a fantastic dance. It was a fantastic experience, one that I am sure my children will always remember.